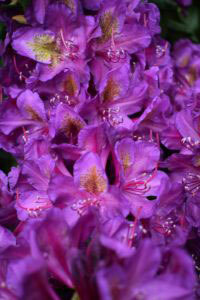 RHS Chelsea Flower Show is the place to be and be seen in May if you are a keen gardener. Even if you’re not very green-fingered, there is still plenty to inspire you with perfect plants and gorgeous gardens around every corner. 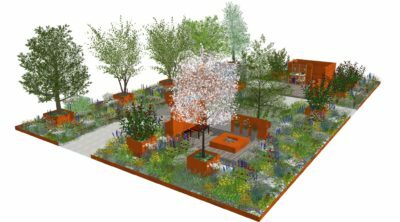 Back in a very chilly January, when it was announced that STIHL were going to be sponsoring a floral exhibit at the RHS Chelsea Flower Show this year, it was quite difficult to imagine the Great Pavilion filled with blooming displays. But then, this wasn’t just any floral exhibit, this was the Hillier Nurseries exhibit, designed by Sarah Eberle! Hillier had won gold for a record-breaking 72 consecutive years in 2017, whilst Sarah entered the Chelsea history books in 2016 when she became the first designer to win gold medals in every category. So, the excitement here at STIHL has been steadily building since the “STIHL Inspiration” by Hillier exhibit was first suggested. As sponsors, we were lucky enough to be included on the guest list for Hillier’s pre-Chelsea Flower Show press day at Ampfield House, near Romsey, where we got a behind-the-scenes look at what it takes to create the gold-medal-winning exhibits that have made Hillier one of the most successful exhibitors in Chelsea’s illustrious history. We were welcomed to the day by Chris Francis, director of Retail and Wholesale at Hillier, who introduced some of the key people involved in the process and explained some of the numbers. 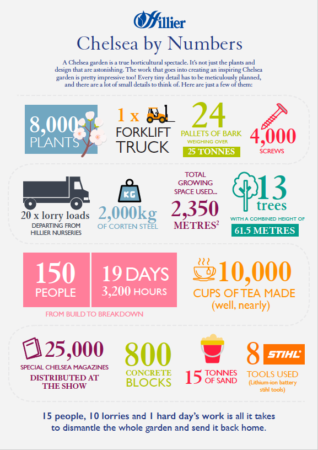 The stand-out number for STIHL is that 8 different STIHL tools will be used in the construction of the stand from secateurs to cut-off saws and chainsaws, but there are some other pretty impressive numbers in there too, not least the 10,000 cups of tea made to keep the team going! But the sheer level of hard work and man hours that go into the exhibit for the Chelsea Flower Show were apparent from the start. Sarah’s passion for plants also shone through when she described designing a floral exhibit as the pinnacle of her career. And when we were treated to a tour of the Hillier glasshouses where the Chelsea plants were being tended to by the dedicated team, you could see that the plants really were the stars of the show. There were two new plants being included in the exhibit this year, Eryngium ‘Blue Waves’ and Hydrangea Aspera ‘Gold Rush’, and we were shown these, as well as numerous other plants, shrubs and trees, in the vast warehouse-like building that was housing them. 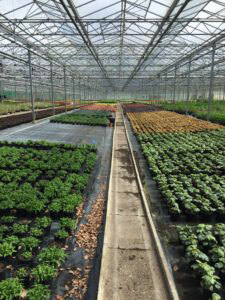 The cold weather at the start of the year had caused some concerns about whether certain plants would be ready in time, but the team have heat lamps to speed up growth, as well as cold stores to slow them down should that be an issue. The build for the exhibit started two weeks before the show opened with around 20 lorry loads of plants and materials making the 80-mile journey from the nurseries to Chelsea. MJT Landscapes and the Hillier planting team had the daunting responsibility of bringing Sarah’s designs to life and worked tirelessly until around 6pm on the Sunday before judgement day (the Monday before the show opens to the public, when the RHS judging team visit all of the exhibits and gardens before deliberating on which ones are worthy of medals). 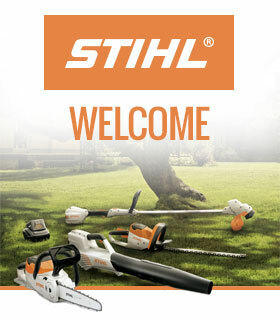 And when the big day finally arrived, the effort had paid off – “STIHL Inspiration” by Hillier looked absolutely stunning! 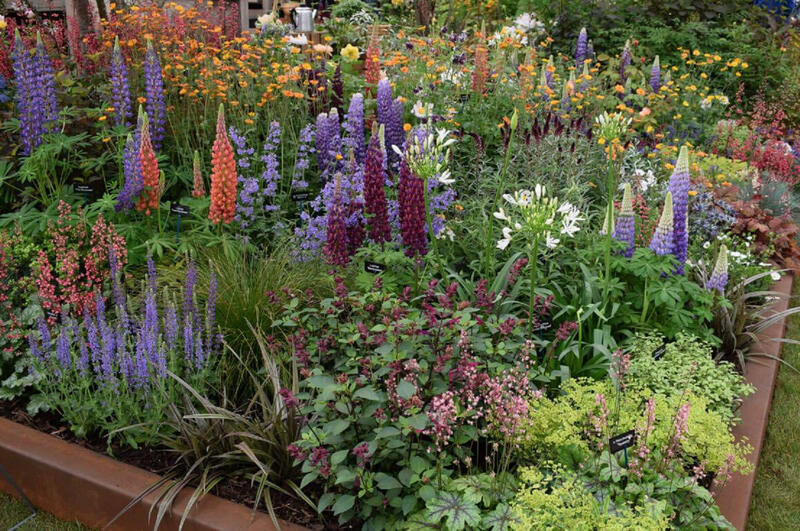 With a gorgeous display of planting, including lupins, salvias, hydrangeas, agapanthus and geum, set amongst 20ft tall acers and against a backdrop of corten steel, the exhibit was an impressive sight in the centre of Chelsea’s Great Pavilion. But the team had to wait almost 24 hours before the judges announced the medal-winners, and despite their record-breaking run of form, they don’t take anything for granted, “If anything, it just adds to the pressure” said Shelley Turner, Head of Marketing at Hillier. So they were delighted when the judges awarded Hillier their 73rd consecutive gold – a truly inspirational achievement which STIHL have been proud to be part of. Well done to all the team at Hillier! 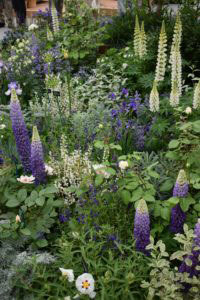 Did you manage to visit the Chelsea Flower Show and see the exceptional exhibit? Let us know what you thought in the comments!